NEW! 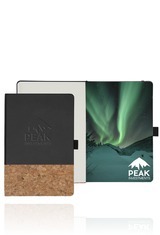 Smooth, hard bound covers, available in 3 colors (Red, Blue, and Black). Includes blind deboss imprint up to 16" sq. and cork accent. 80 sheets of off-white lined paper with matching satin ribbon, elastic privacy closure, and elastic pen loop.